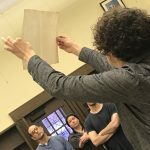 Marie-France Lemay discussing pigments in the Traveling Scriptorium. 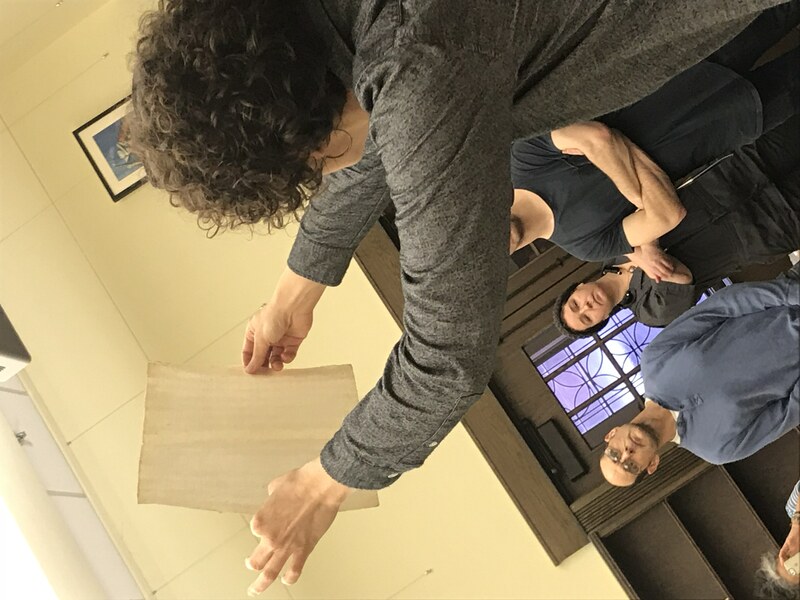 Yale University Library Paper Conservator Marie-France Lemay recently presented two workshops in Special Collection and University Archives’ Ken Kesey Classroom on the materials of medieval and early modern books. 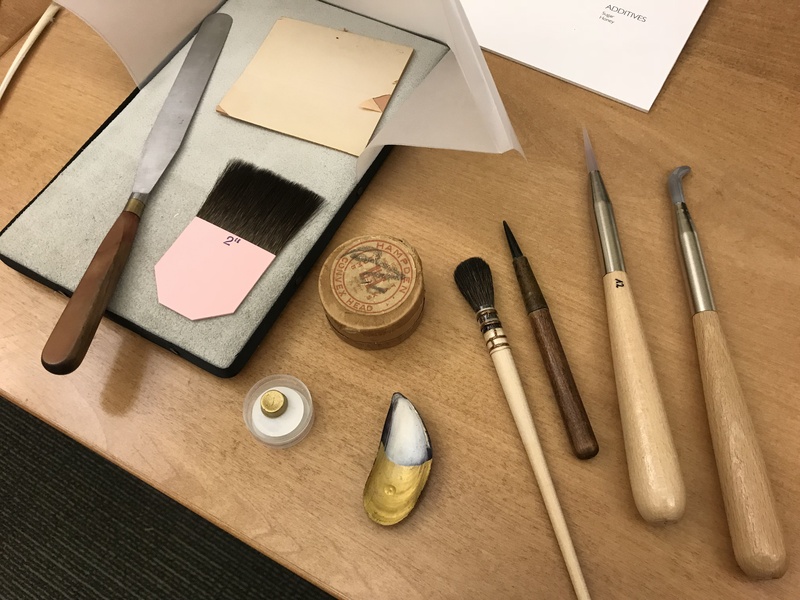 Lemay presented samples of materials and tools that would have been used by early bookmakers and illuminators from the Traveling Scriptorium, a teaching kit created by Yale’s Beineke Library conservators. 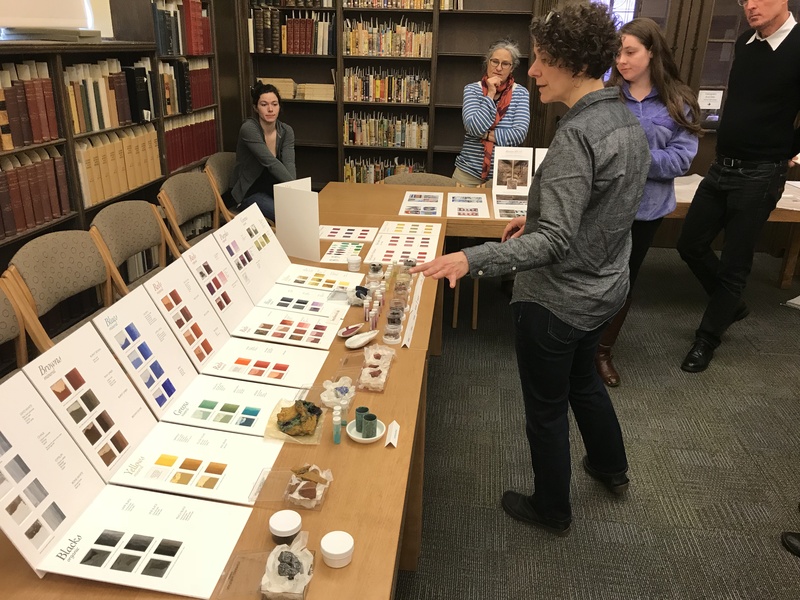 These workshops were arranged by Dr. Vera Keller in conjunction with a JSMA lecture on the history of color in the Italian Baroque period. Lemay provided students from Dr. Vera Keller’s “Global History of Color” and Dr. Nina Amstutz’s “Art and Science” courses with the opportunity to handle raw materials used in historical manuscript production and scribal practices, such as stretched parchment and laid paper used for writing substrates and the ingredients for black iron gall ink (gall nuts from oak trees, green vitriol/iron sulfate, and gum arabic). The workshop also included a mixing demonstration of traditional pigments and inks and discussion of the chemical differences of organic versus inorganic materials and the nature of man-made pigments such as verdigris, produced by exposing copper to acetic acid (vinegar). 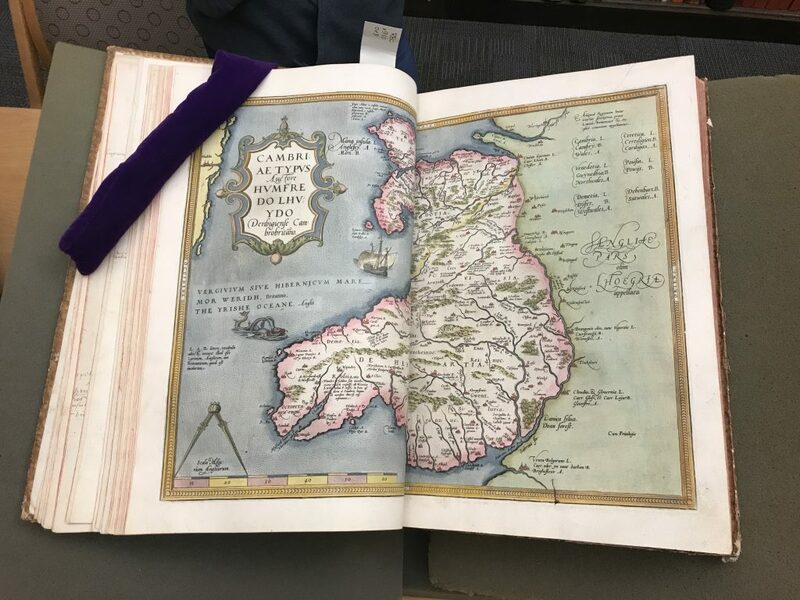 England (far left) is hand colored with blue-green verdigris on our Cambriae Typus map (earliest published map of Wales, by Humphrey Llwyd, 1573) in Abraham Ortelius, Theatrum Orbis Terrarum Additamentum (RBC x 910 0r8). 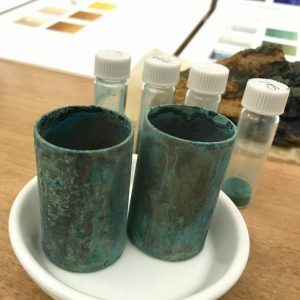 Verdigris produced on copper tubes. Reverse of map showing the corrosive halo caused by verdigris. Alongside the Scriptorium samples, rare books from Special Collections and University Archives were on display as exemplars of particular pigments or techniques, such as shell gold vs. raised gilding, two techniques used to decorate the page with gold. Shell gold painting, so named for the historic practice of using a shell as a vessel for the ink, employs powdered gold mixed with gum arabic for painting thin washes of gold ink. Raised gilding requires thin sheets of delicate gold leaf to be carefully applied to an adhesive or gesso detail and then burnished to create a modeled, high-shine finish. Shell gold added over an engraving of the Virgin Mary. 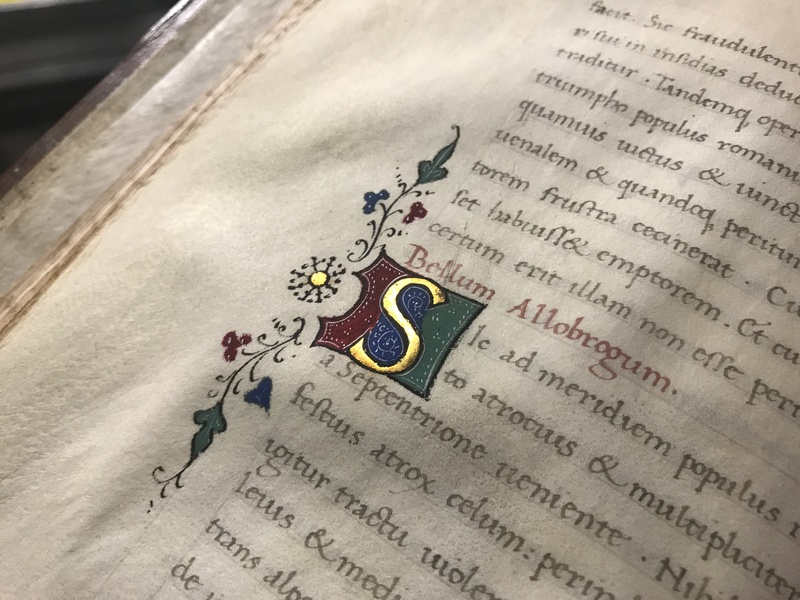 Raised gilding used on an ornately decorated initial. 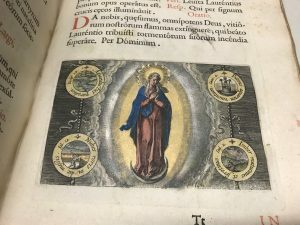 Many of the Traveling Scriptorium teaching materials have been generously made available on their website for those interested in learning more on the subject, including ink and pigment samples, medieval bookbinding terminology, and historical ink and pigment recipes. 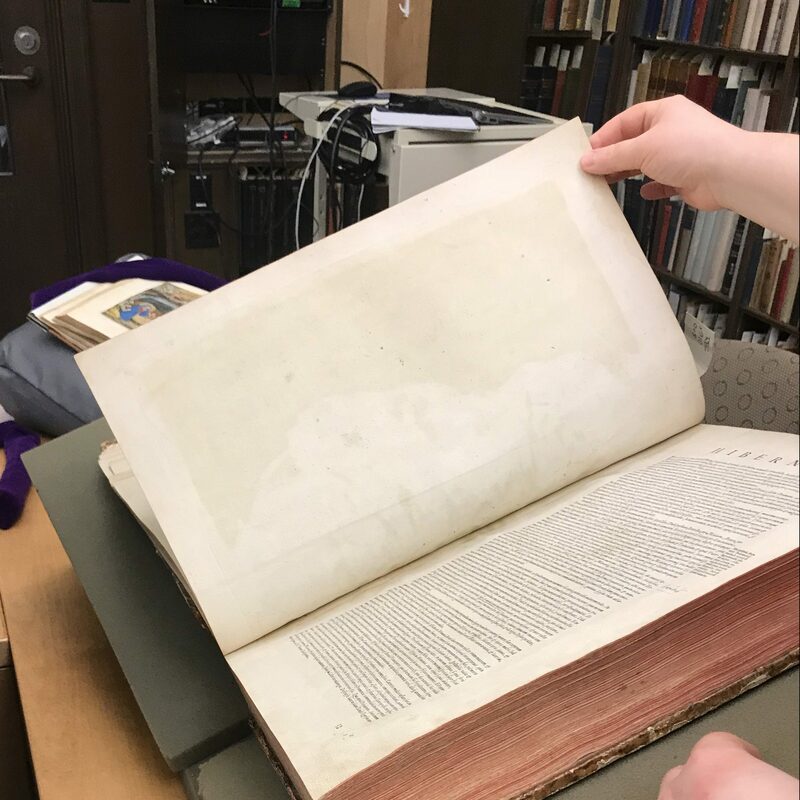 Special Collections and University Archives is available to assist with and coordinate instruction in courses like these where students are encouraged to use primary sources such as manuscripts, archives, photographs, rare books, films, and ephemera. Let us know if you would like to schedule an instruction session or research consultation.